EY announced on May 5th, 2014 that chairman and CEO Gary Kiedaisch of Igloo Products Corp. is a finalist for the EY Entrepreneur Of The Year™ 2014 Award in the Gulf Coast Region. The awards program recognizes entrepreneurial leaders who demonstrate excellence and extraordinary success in such areas as innovation, financial performance and personal commitment to their businesses and communities. This nomination is a testament to all of the hardworking, talented people at Igloo. The successful growth of Igloo is a direct result of their dedication and teamwork, and I would be honored to bring this award home on their behalf. 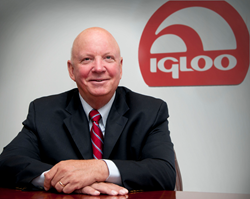 EY announced on May 5th, 2014 that chairman and CEO Gary Kiedaisch of Igloo Products Corp. is a finalist for the EY Entrepreneur Of The Year™ 2014 Award in the Gulf Coast Region. The awards program recognizes entrepreneurial leaders who demonstrate excellence and extraordinary success in such areas as innovation, financial performance and personal commitment to their businesses and communities. Kiedaisch was selected as a finalist from nearly 60 nominations by a panel of independent judges. Award winners will be announced at a special gala event on Thursday, June 26th, 2014 at the Hilton Americas Hotel – Downtown Houston. This is Kiedaisch’s third time participating in the program. He was nominated and became a finalist for the Central West Area first in 2007. In 2013, Kiedaisch was nominated for the second time and named as a finalist for the Gulf Coast Region. In the Gulf Coast Region, sponsors include: Norton Rose Fulbright, Lockton Companies, LLC, BBVA Compass, Colliers International, Solomon Edwards, ADP, Pierpont Communications, Inc. and Smart Business Network, Inc.